David Kherdian, winner of the Newberry Honor award for his book Road From Home, takes us into the life of Alvin Tolliver, a sixth-grade loner with a keen appreciation for nature. Alvin dreams of becoming a tracker and spends his free time exploring the local Wisconsin woods. 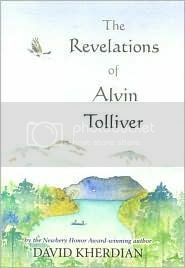 The book is divided into four portions, one for each of the influential adults who help to change Alvin's outlook. While on a nature walk, Alvin falls into a pit and injures his leg. Although Crazy Eli, a disabled man who is unable to speak, has been the object of Alvin and his schoolmates' scorn, he teaches Alvin the value of compassion by rescuing him and tending him with herbs before returning him home. While fishing for muskie, Alvin is taken under the wing of Joe Kerensky, who reveals the secrets of the lake. Alvin is awed and mystified by the beauty of the lake and the creatures that live in and around it, and begins to see the difference between wanting something and truly needing it. Next, Alvin meets Hannah the Bird Lady. When Alvin finds a great horned owl accidentally caught in a hunter's trap with an injured wing, he brings the bird to Hannah, hoping she can nurse the owl to health. Finally, he is honored to meet the legendary Native American outdoorsman, Philip Sunbear, who agrees to include Alvin at his next sweat lodge. The intense experience of the sweat lodge cements the importance of the revelations that Alvin has received on his journey to spiritual maturity. The division of the story into quadrants lends a choppy feel to the book, and some might question how genuine the pre-teen voice of Alvin feels. Though this book is intended for third to sixth grade readers, adults may find the unhurried pace of this coming of age story interesting. Consider this an additional title for libraries with Native American collections.